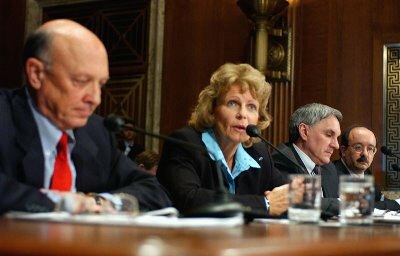 Calling on American lawmakers to "act with urgency," a Ford executive has told the Senate Energy and Natural Resources Committee that policies are needed to support an aggressive, integrated approach by industry and government stakeholders to develop renewable fuels and advanced technology vehicles to overcome the nation's future energy needs. "It is clear the solution to America's energy challenges will need to come from advances in fuels and vehicle technology. The fact is, without the whole-hearted involvement of the oil industry, we cannot move forward far enough and fast enough," said Sue Cischke, Ford vice president of environmental and safety engineering. "We obviously need key partners like the oil industry to invest in developing and marketing renewable fuels, like E85." Ford is committed to a portfolio of advanced technology vehicles to meet the various needs of consumers, including hybrids, flexible fuel vehicles, advanced clean diesels, hydrogen-powered internal combustion engines and fuel cells. The company has led American vehicle makers in developing advanced technology vehicles, building the first American full petrol-electric hybrid and the first hybrid SUV in the world. At the Washington Motor Show in January, Ford unveiled the first-ever hybrid-ethanol demonstration vehicle, a Ford Escape Hybrid E85, combining the two most-promising technologies on the market today. Pointing out that Ford alone has put more than 1.6 million ethanol-capable, or flex-fuel, vehicles on the road in the last decade, Cischke emphasised the need for rapid production of renewable fuels, and the infrastructure to support them. Only 600 of the 170,000 retail petrol stations in the country (USA) carry E85 ethanol, a blend of 85% ethanol and 15% petrol. Cischke said expanding the availability of E85 will be critical to moving America toward energy independence. "For ethanol to be a real player in the transportation sector and lessen America's dependence on foreign oil, we need a strong, long-term focus on policies that increase U.S. ethanol production and accelerate E85 infrastructure development," she said. "We need national research efforts to pursue producing ethanol from more energy efficient cellulosic materials like rice straw, corn stover, switch grass, wood chips or forest residue." Cischke also reiterated Ford’s commitment to produce 250,000 hybrids by 2010, including offering hybrids on half of all America's Ford, Lincoln and Mercury models. Advocating an integrated approach between government and industry stakeholders, Cischke called for an expanded role for federal and state government, including tax credits for research and development and tax incentives for consumers and businesses to utilise renewable fuels. "We fully support government incentives to encourage and accelerate this investment," she said. "The challenges are considerable but not insurmountable, and there is an enormous amount we can achieve if we act together in an integrated manner." 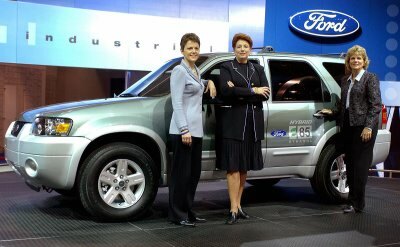 with the new Ford Escape Hybrid E85 on Wednesday, 25th January, 2006 in Washington. vehicle capable of operating on blends of fuel containing as much as 85 percent ethanol.